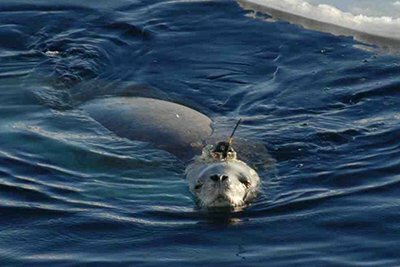 The movements of marine mammals and other large animals that spend their lives in the ocean were largely unknown prior to the development of sophisticated tracking devices researchers could deploy on animals in the wild. Insights gained from this technology have revealed unexpected behaviors and migratory patterns in marine animals ranging from sharks and seals to turtles and albatrosses. Researchers from around the world have now pooled their data on the movements of a wide array of marine animals, enabling them to look for common features in how animals move throughout the world's oceans. The results, published February 26 in Proceedings of the National Academy of Sciences, show remarkable convergence in the movement patterns of different species, even those widely separated by geography, phylogeny (evolutionary history), or mode of travel. The biggest differences were between different habitats rather than between different species. 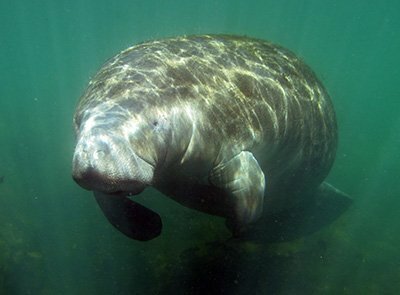 In coastal areas, tracking tags revealed complex movement patterns dominated by search behavior, while in the open ocean they showed simpler, more predictable movements over longer distances. "It makes sense, because the coast is a much more complicated environment, whereas the open ocean is more homogeneous and the features are more spread out in space and time," said coauthor Daniel Costa, a distinguished professor of ecology and evolutionary biology at UC Santa Cruz. "Regardless of what species it is, the movement patterns match the oceanographic features of their environment." These insights can be useful, he said, for understanding how marine life will respond to climate change and for predicting the movements of species for which tracking data are lacking. 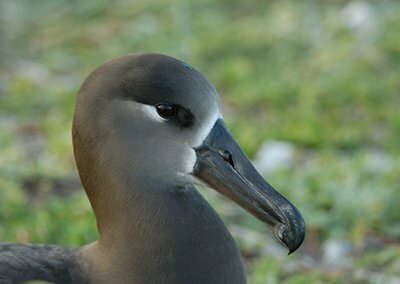 "Many of these species are endangered and we have no tracking data, but we can extrapolate from other species to understand how they are likely to interact with fisheries, shipping, or other human activities," Costa said. Costa has been at the forefront of developing high-tech tracking devices and using them to study marine animals. Over the last several decades, he has pioneered the use of many of those devices on the northern elephant seals of the NRS's Año Nuevo Island Reserve. 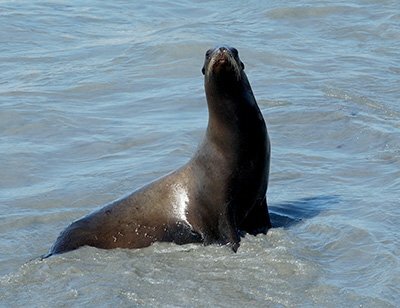 This work has helped make UCSC a leading site for the study of marine vertebrates such as sea lions, sea otters, dolphins, and whales The coauthors of the PNAS paper include six other UC Santa Cruz researchers in addition to Costa. "This paper is the result of a big international effort. We realized that if we all share our data and work together in a concerted manner, we can learn a lot more about these animals," he said. 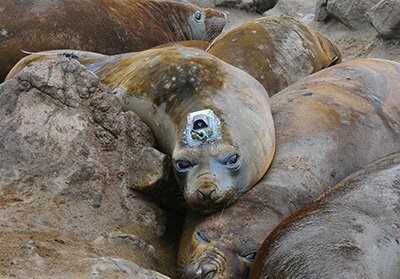 Costa and other UCSC researchers deployed the first satellite tracking tags on elephant seals at the Año Nuevo rookery north of Santa Cruz in the 1990s. The initial results were astonishing. "Before we put tags on elephant seals, all the books said they were limited to the California Current. We had no idea they were traveling these incredible distances and using the entire North Pacific Ocean," Costa said. "We went from studying them where we could watch them to having the animals tell us where they were going." In 2000, Costa joined forces with Barbara Block at Stanford University and others to launch the Tagging of Pacific Predators (TOPP) program, a decade-long effort to track the movements of top marine predators in the Pacific Ocean. Costa oversaw the tracking of marine mammals, birds, and turtles for TOPP, which also included tracking of sharks and tunas. One recent study, published February 14 in Biology Letters, revealed the effects of pregnancy on the diving behavior of female elephant seals. 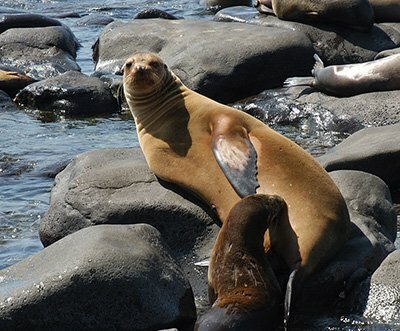 Led by postdoctoral researcher Luis Huckstadt, the researchers found that the dives of pregnant seals became shorter, probably due to an increasing demand for oxygen for the fetus. "The only way we could do that is because we now have over 500 tracks of female elephant seals, and a small number of them didn't have a pup or lost it at sea, so we could compare and see the effects of pregnancy. It's not surprising, but nobody had been able to document it," Costa said. Huckstadt is also a coauthor of the PNAS paper, as is doctoral candidate Anthony Pagano, whose research on polar bears in the Arctic was recently published in Science, and associate researcher Ari Friedlaender, who has led tracking studies of blue whales. Other UCSC contributors include coauthors Patrick Robinson, Stella Villegas, and Elizabeth McHuron. The PNAS paper was led by first authors Ana Sequeira at the University of Western Australia and Jorge Rodriguez at the Institute for Cross-Disciplinary Physics and Complex Systems in Spain.